The demand for mineral water is increasing at a rapid rate, as people become more health conscious and take precautions against water borne diseases. 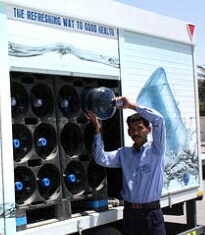 Bottled mineral water provides easy transportability and assured water quality. The plant is being designed for minimum economically viable capacity, such that the capital outlay is optimized. 1] Purification: Water received from the external source/Bore Well is passed through the purification plant and stored in a PE-Fiber Tank. Thereafter it is fed to the bottling section – and continuos operation achieved. 2] Bottle Manufacturing: Pet preforms are blown into bottles and a sufficient number of bottles, say 1000 nos., kept ready while the machine continues to produce more during the shift, when the bottling has been started. (Optional) Usually purchase readily available in Market with various bottles manufacturers. Economically can be done by manually as well both Rinsing/Washing and Bottle Filling. 4] Labeling: We are proposing use of heat shrink labels and tamper evident heat shrink sleeve on the neck of each bottle. 5] Heat Shrinking: The bottles are passed through heat shrink tunnel so that the label and neck sleeve, shrink and stick to the bottles. 6] Final Packing: This could be in cartons – done manually – and no machines have been provided for it. (Small Bottles). The various machines and equipment being offered by us and required is explicitly listed here. This does not include miscellaneous items like pipes, electricals etc., which are specific to the site and each project. Flow Rate : 30 GPM. Permeate Flow : 10000 Gallons/Day. Membrane – 2 8X40 nos. Pressure Vessel 8×80” (Fiber Glass) – 1 nos. Flow Rate : 3000 lit/hr. To achieve 1100 nos. bottles per hour production. – With Infrared heating system conveyor and separate Control Panel with Microprocessor. This section receives the empty bottles, rinses them, fills and caps them. Made of S.S, 8 meter long for conveying of empty washed bottles onto the filling machine. The different operations like rinsing, filling, capping are done on the conveyor. Electrical Details: 0.5 H.P. with variable speed drive.. This machine is designed to fill 24 bottles per minute for 1 ltr bottle & is capable to fill 500 ml, 1000 ml, 1500 ml bottles. Machine speed is depended on the volume to be filled. The bottles are holded in groups of 6 & moved on the conveyor together. These grouped bottles are rinsed by means of spraying pressurized water inside the bottle. After Rincing the bottles are again placed on the conveyor & are loaded on the filling & capping machine one by one. Filling & capping takes place by indexing mechanism. There are total 8 indexes. This is fitted on the online conveyor to shrink labels and neck sleeves. The labels & neck sleeves are to be manually inserted on the bottle. Machine will be provided with suitable capacity Heaters, Blower, Reduction Gear Box and Electric Motor, complete in all respects ready to use. This is a table top coding machine with a printing area of 35 mm x 25 mm & capable of printing 3 variable line message on labels or caps. The water source is of critical importance and the continuity of the plant would depend upon it. Apart from water following items are required and can be supplied by us. 5] Cartons for final packing. 1] Bottling – 1 nos. 2] Labeling – 2 nos. 3] Bottle making – 2 nos. 4] Printing – 1 no. 5] Packing – 2 nos. 6] Miscellaneous – 2 nos. Total – 10 nos. (On manually operation 3-5 people enough for man power depend what size of bottle produce.